The arguments against no-fault divorce simply don’t add up - Looking at the arguments against no-fault divorce, as set out in the House of Commons Library's briefing paper. The chicken that is the government’s family justice policy is coming home to roost - As demonstrated by the latest statistics. Katy Ashworth case demonstrates the conundrum of transparency in child cases - The publicity judgment in Re Alcott. 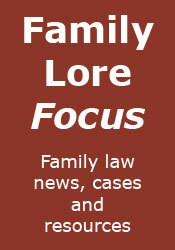 Daughter fails in claim against her father’s estate - The Inheritance Act case Ames v Jones & Ors.